Infinity Farm is on the flat, windy, treeless prairie, where there’s no top to the sky and the low-billowing earth creeps along without much drama. There’s a symmetry to the landscape you can learn to love. ← Left in the Dust: Your Ridiculously Slow Response Time. I know I’m a bit twisted, but mucking does the trick for me. Yeah – I can understand that – but somehow the happy happy munching really does the trick for me! Hehehe, thanks, Chris… they are doing an impression of the prairie! 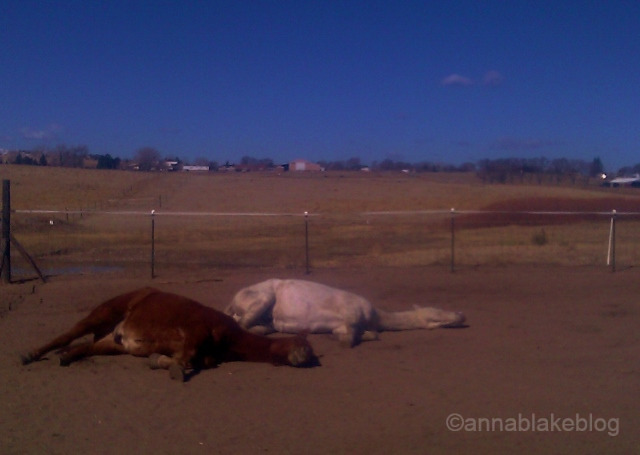 Horses look so dead when they lie down like that. 🙂 I love when they roll. Sometimes the whole herd is down and it gives a start! Well, you have checked all the obvious things and a couple things that aren’t obvious. Assuming that he is well, his teeth are good, etc. It’s great that he doesn’t do it undersaddle. I am hesitant to guess without seeing him, because my eyes might ‘hear’ something different in person, or I might read him differently if I met him in real life… If you think he is telling you it’s itchy, when grooming take a stiff brush and give him a good scratch, in a way, de-sensitize his nose by brushing. He will get more stimulated in the beginning, it may be hard to tell if it’s working. My other guess sounds lame, but it is what I would do: Ignore it. Never put a hand around his mouth, stand out of his space, don’t do anything that might be a bit like teasing. Ignore it till he forgets it–it will take a while. Again, I hate to guess when I don’t know the horse… good luck. Let me know if either works. Love the synchronized napping. I give them a 9.5. Thank you. We look forward to competing in the summer games.